In this experiment, students will be introduced to surface tension and density through a colorful presentation. What properties does surface tension itself affect? Surface Tension allows liquids to resist an external force. This property allows some objects that are denser than water to actually float. Surface tension results from the greater attraction of water molecules to each other than to air. In a pretty deep dish, add about ½ – 1 inch of milk. 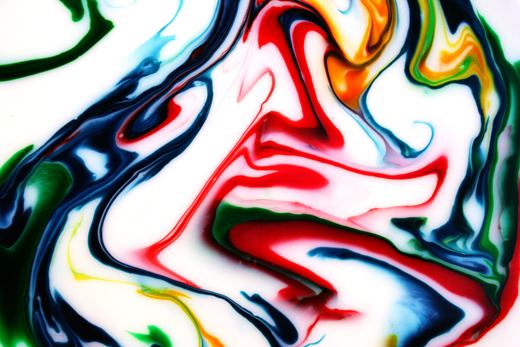 Put a few drops of food coloring on the surface of the milk. The colors, amount, and arrangement can be however you like. Put 2 drops of dishwashing liquid in the dish. Observe what happens to the surface of the milk.